Yesterday Enviri and I spent the afternoon (and into the late evening) replacing our door panel fabric. I replaced the fabric on my 09 5 door with black perforated leather, of which I bought half of a cow hide off ebay for about $60 shipped. He replaced his 08 3 door fabric with black vinyl to match the outer portion of the Clazzio cover. In my case, the rear doors of the 5 door are much more difficult as the plastic door trim is fused as one complete assembly. The fabric on front doors on the 3 and 5 door is only tucked on 1 of four sides. The fabric for the rear door of the 5 door is tucked on three of the four sides, requiring me to drill out (and later repair) the plastic bosses that are melted to fuse the door sections together. In Enviri's case the vinyl, which he also purchased via ebay, was extremely stiff, making it a bear to tuck and to get it to properly conform to the contours of the door panel. 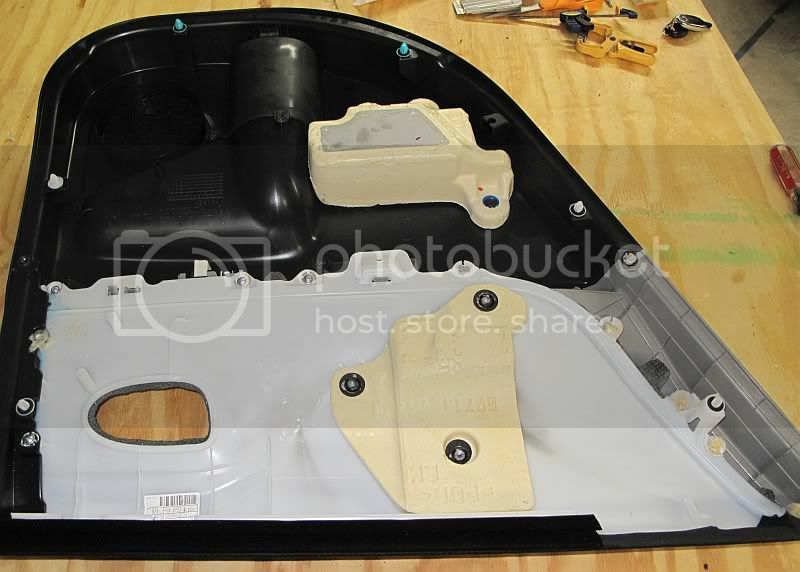 Rear door panel construction - The white area is the part which is covered with the fabric. There were 11 plastic bosses that came up from the gray part, through holes in the white part, and then were melted to bond the two parts together. I drilled all of the side bonds and three of the bottom ones to allow me to get the OEM fabric off and to be able to mount and tuck the leather. To repair them I was able to use 3/4" long self-tapping washer head screws for 5 of them. The remainder were too short for screws, so I used Devcon High-Strength Plastic Welder to repair them. worked like a charm, not i can just unsnap the parts and re-snap them back into place! Location: Just chillin' out brah ! Damn that looks clean ! 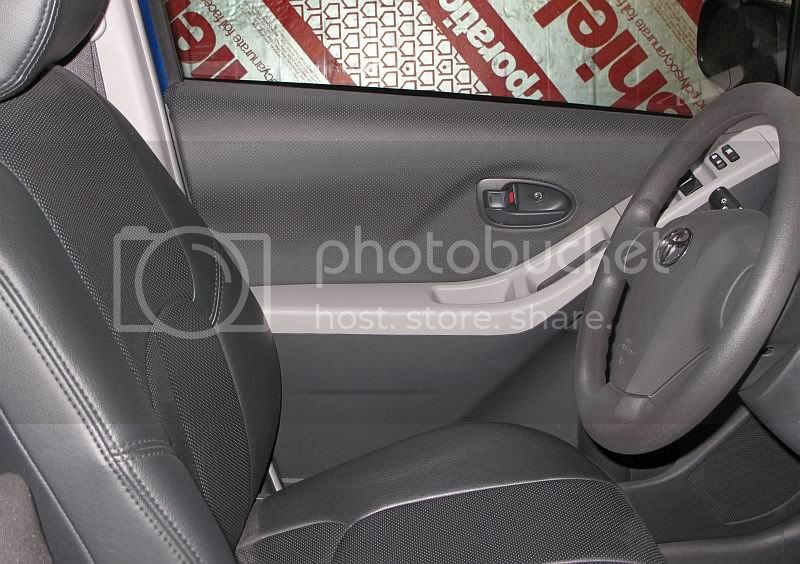 Looks very nice , i would love too have leather seat covers and door trim's . wow, looks super professional, nice and clean, no flaws that i can see, Awesome job dude! 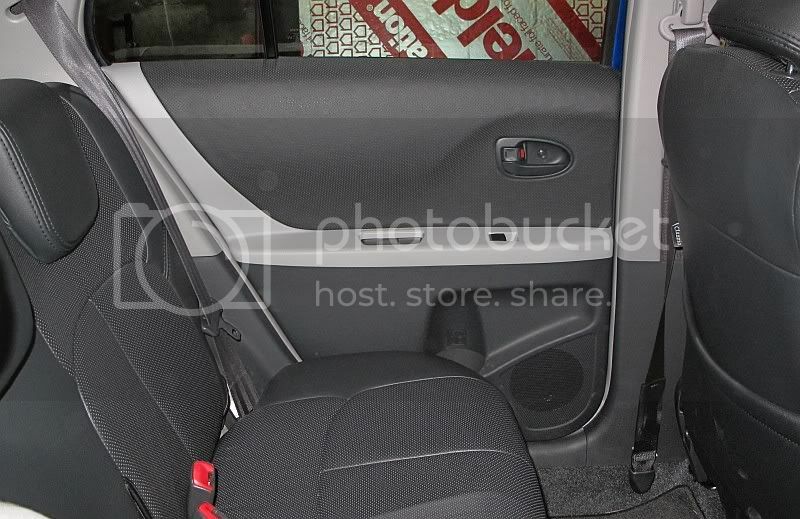 I am trying to install speakers into the rear doors on my 2007 Toyota Vitz that I own in Japan. However, the rear panels don't have the speaker holes that this car has. Anybody have any idea where I can order the panels for my car?